March 21 marks the beginning of the Spring Equinox and the search giant Google has released a doodle for this day. It is also called the March equinox or Northward equinox. The phenomenon has different names in different parts of the earth. The Northern hemisphere calls it the vernal equinox and in the Southern hemisphere it is called as the autumnal equinox. Spring equinox is when the day and night are equal in length. It marks the end of winter and beginning of the spring in the Northern Hemisphere. This year, the spring equinox also coincides with a supermoon, a phenomenon that's happening after 19 years. Called the Full Worm Supermoon, it is the last supermoon of the year. Full Worm Supermoon 2019: Know About the Last Supermoon of This Year on March 20. 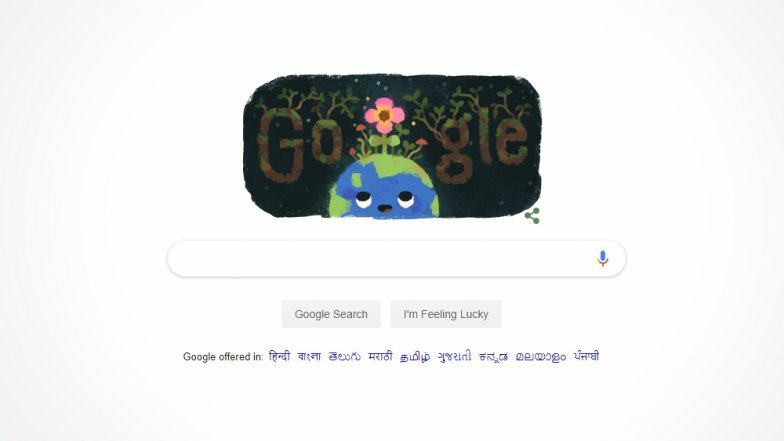 The Google Doodle is an illustration which shows a small flower blooming on the top of the earth. The other letters also symbolise the roots of the trees. It marks the idea of the beginning of spring with new blooms everywhere. The earth is shown smiling, happy at the blooming flowers. World Wide Web Turns 30! Google Dedicates Doodle to Celebrate Momentous Occasion. The word equinox comes from the Latin word which means "equality of night and day". On the equinox, the sun shines directly on the equator. The sun crosses the celestial equator from south to north. So it rises directly in the east and sets directly in the west. Unlike the other part of the year, where it is not direct but at the off-centre. The Match equinox is characterized by having an almost exactly equal amount of daylight and night across most latitudes on Earth. Full Worm Supermoon 2019: Know About the Last Supermoon of This Year on March 20. This March equinox or vernal equinox is significant because of the Full worm supermoon. This is also the last supermoon of the year 2019. The last time such an event occurred was in the year 2000.